For the first time in more than three decades, scientists are going to get a close-up view of Mercury, Earth's smallest neighbor and the rocky planet closest to the sun. The mission MESSENGER (for "Mercury Surface, Space Environment, Geochemistry, and Ranging") launched successfully from Cape Canaveral in Florida yesterday. Before MESSENGER was launched yesterday from the Kennedy Space Center, a worker inspected it during its final tests and assembly at Astrotech Space Operations in Titusville, Fla. Image courtesy of NASA. Set to first reach Mercury in 2008, the tiny spacecraft will shoot past Earth in 2005, round Venus twice and then take a slingshot path back toward its goal. The extra loops are to help slow down the speeding craft, so it can coast into an orbit around the planet. NASA plans for three flybys of Mercury in three years; MESSENGER is scheduled to settle into orbit by March 2011. The last images sent to Earth from Mercury were from Mariner 10, from 1974 to 1975. Scientists are still piecing together that data, which captured only half the planet. "We know almost nothing about Mercury's composition," says Sean Solomon of the Carnegie Institution of Washington and the principal investigator on the project. "Mariner 10 did not do any remote geochemical sensing," and MESSENGER will see that unknown side of the planet for the first time in its first two passes. The project, one of over half a dozen small exploratory missions that NASA initiated in the 1990s, cost around $427 million. Equipped with a multitude of instruments, most of which were produced at the Applied Physics Laboratory of Johns Hopkins University, MESSENGER's mission is to answer key science questions regarding Mercury's density, geologic history and core composition. Most mysterious is why the planet has a magnetic field like Earth's, even though Earth's other sister planets, Venus and Mars, do not. Researchers would also like to know if Mercury experienced volcanism. 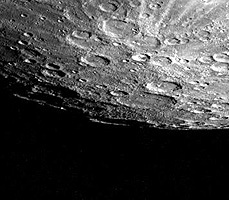 Mercury's south pole as viewed by Mariner 10 on a flyby in the 1970s. Some Earth-based observations indicate there may be water ice or other captured volatiles in the cold dark corners of some impact craters at Mercury's poles. Image courtesy of NASA. 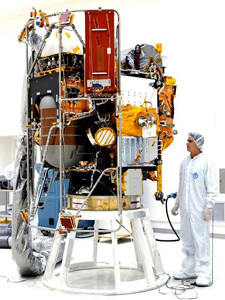 Among the instruments onboard are gamma and X-ray spectrometers to track the abundance of elements in Mercury's crust and a laser altimeter for detailed surface mapping. Two instruments  a magnetometer and particle spectrometer  will further document the planet's magnetic field and magnetosphere. Another instrument that measures how MESSENGER's velocity changes in orbit will give data for crustal thickness and mass distribution. After its instruments peer at the magnetic field, atmosphere, surface and innards of the planet, MESSENGER will end up crashing on Mercury, from its orbiting perch 200 to 15,000 kilometers above the surface.